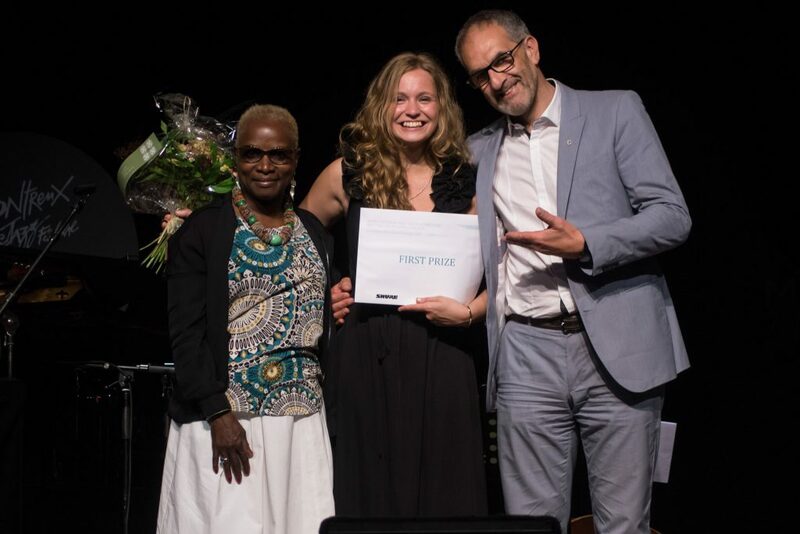 Arta Jekabsone, center, after winning first place at the Montreux Jazz Vocal Competition in Switzerland. Three weeks before she was set to compete in the Shure Montreux Jazz Voice Competition in Switzerland, Arta Jekabsone, Jazz ’17, injured her voice so badly her doctor advised her not to perform. Armed with a stubborn attitude, and encouraging words from her professors, Jekabsone traveled to the festival anyway. She won first place. If the experience taught her anything, it’s that “you don’t always need a beautifully sung melody or perfect pitch” to connect with listeners. Jekabsone’s winning performance featured a song delivered in her mother tongue of Latvian, underscoring the international flavor of the highly competitive festival. Her application to the festival included two songs that were recorded with the help of New School musicians. Jekabsone, who recently returned to Montreux for a week of workshops and performances, is starting her career with an acclaimed honor on her resume.